Patrik Lindström Synthpop, Pop It's been four years since we last heard anything from Mesh in form of a full length album. Last time it was the much appreciated 'Who Watches Over Me?' that was released and the year was 2002. Visually in our whereabouts we were able to enjoy great gigs, first on the Arvika festival in 2003 and shortly after at SAMA 2004. For you that been longing for more heartache and tears, you don't have to wait anymore, because one of the worlds greatest synthpop acts, Mesh, is now releasing their first tracks from their upcoming album 'We Collide'. 'Crash'' is a real synth bash that will be sorted with the rest of the earlier classics like "Trust You", "You didn't want me", "Someone to believe in" and many, many more. The chorus in ''Crash'' stick the first time you hear the track, during the last chorus of the song I gladly sang along even though it was the first time I heard the song, where I stood doing the dishes with my red brush and my yellow gloves. After that the more guitar poppy track "Souls" follow and the whole thing is finished off with "In This World" that is about if its worth to bring another little life into this world, with all its flaws. The same day this review was written, the album ''We Collide'' fell down my mailbox and I promise a review of it to the next update. 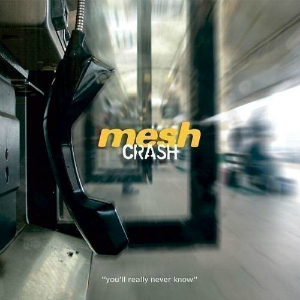 It's been four years since we last heard anything from Mesh in form of a full length album. Last time it was the much appreciated 'Who Watches Over Me?' that was released and the year was 2002. Visually in our whereabouts we were able to enjoy great gigs, first on the Arvika festival in 2003 and shortly after at SAMA 2004. For you that been longing for more heartache and tears, you don't have to wait anymore, because one of the worlds greatest synthpop acts, Mesh, is now releasing their first tracks from their upcoming album 'We Collide'.